The EU EOM The Gambia 2017 Chief Observer Miroslav Poche presents the Preliminary Statement. The Mission concluded: “Goodwill on behalf of the people and institutions of The Gambia provides for the restoration of key democratic rights”. The highly contested National Assembly elections were held in a calm and peaceful atmosphere, following an engaging campaign where fundamental freedoms of assembly, expression and association were respected, while media presented the electorate with a range of political choices free of formal censorship. The Independent Electoral Commission enjoyed broad stakeholders’ trust and, against budgetary and time constraints, delivered elections in a commendable manner. This happened despite a highly imperfect electoral framework inherited from the past regime, where judiciary was systematically undermined and respect for regional and international standards for democratic elections was neglected. On 6 April 56 EU EOM The Gambia 2017 observers drawn from EU member states, Norway and Switzerland observed election day proceedings in 222 polling stations across the country. The tabulation of results was observed in all regional collation centers. The election day proceeded in an orderly manner, and knowledgeable polling station staff efficiently facilitated voting. The counting of ballot marbles proved to be swift and transparent. The lack of transparency and accountability measures, stemming from the absence of written procedures for the collation of results, detracted from the overall very positive assessment of opening, voting and counting. The immediate announcement of aggregated results per constituency on national television and radio fostered transparency. “The European Union sees The Gambia as an important partner. The invitation to deploy the first-ever fully-fledged election observation mission is highly appreciated by the European Union. It confirms the commitment of both sides to promoting democracy and deepening political and economic cooperation. The European Union stands ready to support the reform agenda launched recently by the government of The Gambia,” stated EU EOM The Gambia 2017 Chief Observer Miroslav Poche, a member of the European Parliament from the Czech Republic. Outlining areas for future improvement, observers concluded that large population discrepancies between electoral constituencies violated the principle of equality of the vote. Furthermore, the outdated voter register and absence of measures enabling police and polling staff to cast their votes at their duty stations disenfranchised a considerable number of eligible voters. The mission also noted that the absence of a complete Supreme Court bench ready to adjudicate on election petitions would undermine respect for the right to a timely and effective remedy. 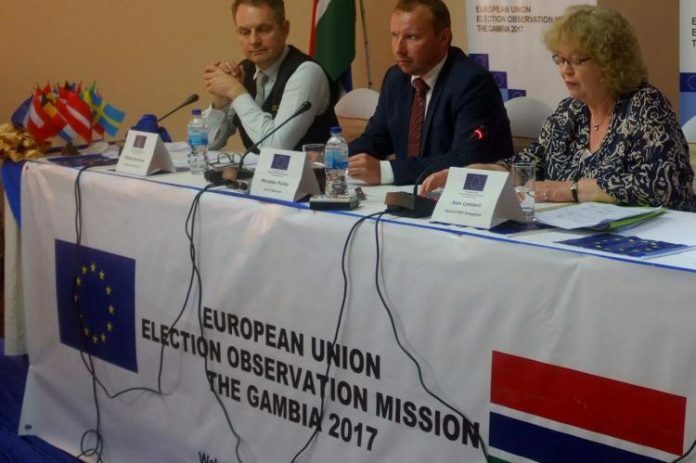 The EU EOM The Gambia 2017 commended the civil society commitment to the democratic process, as shown by the deployment of 400 citizen observers on the election day. “The Gambia has been through a historical moment with many things changing almost overnight. A few shortcomings have been identified in the election conduct. However, given the circumstances, I would like to express my great respect to the IEC as well as to the Gambian citizens for the peaceful atmosphere of the election day,” notes Jean Lambert (United Kingdom), head of the European Parliament delegation which joined the EU EOM The Gambia 2017 on 4 April and fully endorsed the Preliminary Statement. The EU EOM The Gambia 2017 preliminary findings are based on long-term, nation-wide observation, the first ever the EU has conducted in The Gambia. The mission has been present in the country since 13 March and will remain to observe the adjudication of post-election complaints, if any. The mission’s final assessment of the elections will depend, in part, on the conduct of the remaining stages of the elections, including the handling of possible post-election disputes. A comprehensive final report, including recommendations for potential improvements, will be presented to the IEC, Gambian authorities and other electoral stakeholders for their consideration, approximately two months after the conclusion of the process.